Cedar Rapids, Iowa (July 4, 1967) – Jerry Richert, the three-time International Motor Contest Association sprint car champion from Forest Lake, Minn., led from start to finish in the 30-lap Independence Day Classic before 5,500 race fans at Hawkeye Downs. It wasn’t all that easy though. 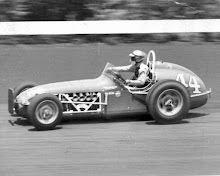 Richert, driving the Wagner Chevy, had plenty of pressure from Tom Corbin of Carrollton, Mo., Jay Woodside of Kansas City and Karl Busson of Toledo, Ohio. Busson latched on to second place early in the race and several times nearly pulled up aside Richert. Towards the end of the feature, Woodside slipped past Busson and nearly got the job done. 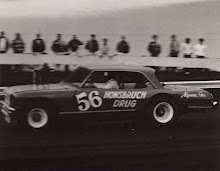 But Richert employed his rim-riding tactics to get a hold of the lead and Woodside would settle for runner-up honors. Busson would hold on for third, Corbin was fourth and Buzz Barton of Tampa, Fla., was fifth. The race was close all the way, and you could have thrown a blanket on the top four places for the entire 30 circuits. Local favorite Lee Kunzman of Guttenberg, Iowa, dropped out of the feature early when wasn’t handling properly. 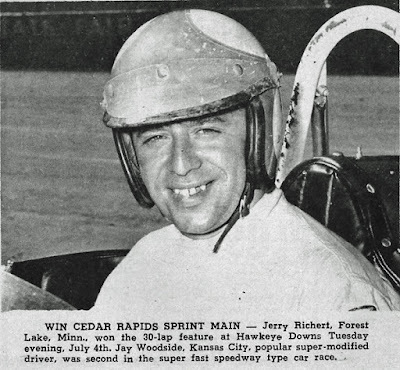 But he would serve notice early in the program when he ran away from the rest of the field in the first heat and set a new world record in the 10-lap heat. The other heat win went to Bob Tomlinson of Palo Park, Ill., with Hank Smith of Mt. Ayr, Iowa copping the 7-lap STP trophy dash and Dale McCarty of Kansas City winning the semi-main. Cliff Blundy of Galesburg, Ill., the 21-year-old son of sprint car ace Jerry Blundy, suffered possible serious injuries when he lost a wheel at the start of the second heat and went into a violent flip. Blundy flipped over the guard rail on the third turn, and reportedly landed upside down outside the race track. His father Jerry, who set fast time in qualifying at 22.08 seconds, scratched from the feature to be at Cliff’s bedside at the hospital. 4. 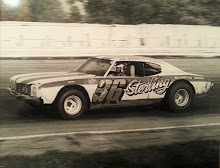 Tom Corbin, Carrollton, Mo. 5. Buzz Barton, Tampa, Fla.
6. Jim Moughan, Springfield, Ill.
8. 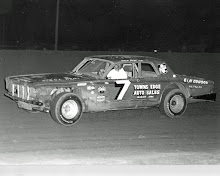 Tom Custer, Rock Island, Ill.
10. 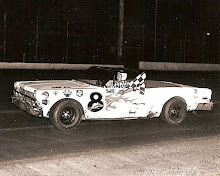 Russ Laursen, Cumberland, Wis.